Model checking invariant properties of designs, represented as transition systems, with non-linear real arithmetic (NRA), is an important though very hard problem. On the one hand NRA is a hard-to-solve theory; on the other hand most of the powerful model checking techniques lack support for NRA. 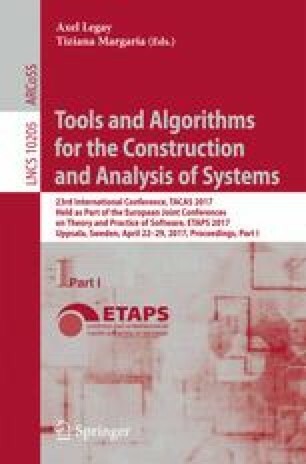 In this paper, we present a counterexample-guided abstraction refinement (CEGAR) approach that leverages linearization techniques from differential calculus to enable the use of mature and efficient model checking algorithms for transition systems on linear real arithmetic (LRA) with uninterpreted functions (EUF). The results of an empirical evaluation confirm the validity and potential of this approach. This work was performed as part of the H2020-FETOPEN-2016-2017-CSA project SC\(^2\) (712689). We greatly thank the iSAT3 team for providing the latest iSAT3 executable and iSAT3-CFG benchmarks. We also thank James Davenport for the fruitful discussions on CAD techniques and finding solutions in NRA.